Because of their interesting and unique shapes, gourds are excellent for use in a wide variety of crafts. This is a guide about crafts made with gourds. One of the many gourds I have done. This features a large kettle gourd, cut open. The opening has been coiled with long SC pine needles. The process is actually a weaving technique, and adds a nice touch to many gourds. 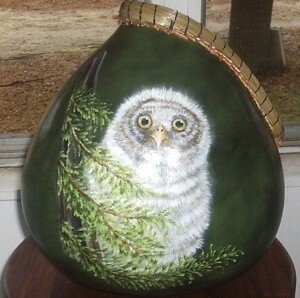 The gourd has been hand painted with a snowy owl on the front. This is one of my signature pieces. All are numbered and dated. 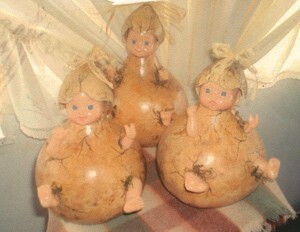 Introducing "Sprouts", I just love these little people (gourds.) They are the perfect baby shower gift. I do personalize them with the date, weight, and name of the newborn baby. I take a baby doll and insert in inside of the gourd. Wood burned cracks are done to simulate a cracked egg where the arms and legs come through. Things you will need are a small, medium, or large gourd, depending on how big you want her to be. Make sure you wash the gourd with warm soapy water and rinse clean. Let set and dry at least 30 - 45 minutes. 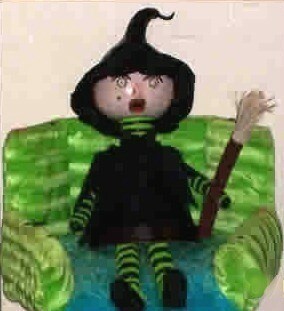 Do all of your painting and let dry before you put your witch together. While you are waiting get together your materials you will be using. You can paint your own eyes, or use stick on eyes and rubber paper. Use it like glue when attaching the neck to the head and body. If you are using a really big gourd, you might need to use a bigger pot. Cut the Styrofoam for the arms to match the size of the pot and head. You don't want it to look out of proportion (lol), and the same with the her legs and feet which is all one piece, then paint. Cut the black material for her cape (make a small band at the top of it and thread a black string through it and tie it on the neck. Connect the legs to the pot, attach a piece of wire hanger across the hole in the bottom of the pot, then bend the leg wire in half over the cross wire. Now attach the legs to the wire by putting a little adhesive on the top of the legs where you are going to push the wire into the middle of the length of the legs. 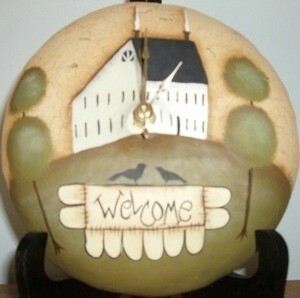 I am looking for images to paint on gourds for the flower bed. Does anyone have some ideas? Some of the shapes I have are bottle gourds, warty gourds, and swans. Thank you. Ho..Ho..Ho! Santa Gourd. He is just the cutest gourd I have ever painted for the holidays. He makes a great centerpiece for a holiday table. Enjoy! This is a half gourd, and painted in a primitive scene I call "Penny Rug Welcome". This particular design has been painted on many sizes of gourds, as it is one of a very popular request of folks. The piece measures approximately 9 inches across.